Several blasts have ripped through Kaohsiung, a city in south-western Taiwan, killing at least 25, injuring over 270 and overturning the cars in the street, the Fire Agency said. The cause is thought to be gas leaks in the sewage system. 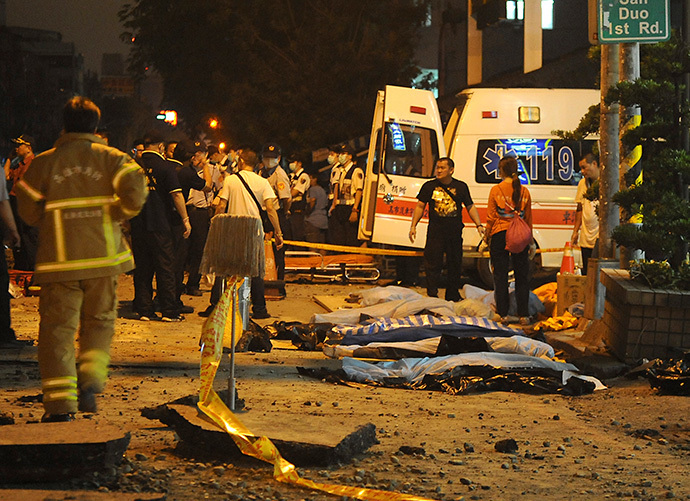 The blasts late Thursday killed at least 25 people and left 277 others injured, CCTV News said. Two people are missing. The number of those injured is expected to rise, the Fire Department said, adding that there were four firefighters among those killed. Authorities have urged people to leave the dangerous site while police have corded off part of the street to allow checking of the leakage point, Xinhua reports. According to witnesses, gas leaks began at around 9:00 p.m. local time. The leaking gas formed a white fog, which then ignited leading to big explosions on several streets, China’s Central News Agency reported. "I saw fire spurting, ripping off some covers of ditches. It was terrifying," a witness told CNA. "The explosions were like thunder and the road in front of my shop ripped open. It felt like an earthquake," another eyewitness said. Some witnesses told the agency they first thought some "poisonous gas" had leaked from the old railway and a construction site of Kaohsiung's light rapid transit system. Others reported that the whole street was strewn with bodies, as the sky turned red from the flames. 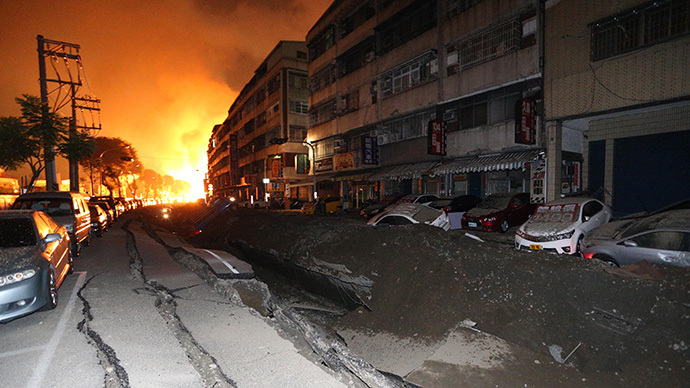 The blasts which hit Kaisuan Road and Ersheng Road were felt in at least four areas in the port-city of Kaohsiung, which is home to over 2.7 million people, most of them Chinese. The previous major blast in Taiwan took place in April 201 4 people were killed and 18 injured after a string of explosives went off at a factory in northern Taipei city causing a huge fire ball. The factory was illegal and made fake paper money used in religious festivals.